We all know a bottle of wine packs a calorie punch. But do you know how many sugars are in just one glass? Probably not. Generally one 175ml serving will contain between a quarter-teaspoon and two teaspoons of sugar. This means splitting a bottle of wine over dinner - around two or three glasses - could contain around three teaspoons of sugar, which is two-thirds of a woman's recommended daily sugar intake. 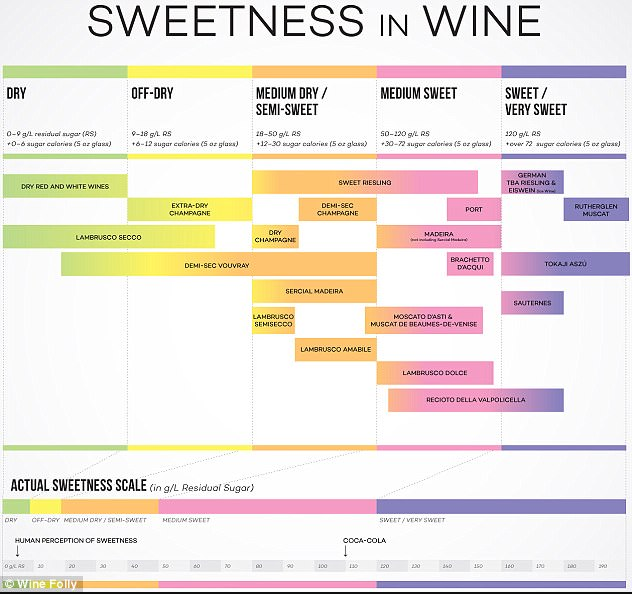 The amount of sweetener in wine will depend on the color and manufacturer. And it's bad news for summer's rosé lovers: red is the best option for dieters, while lighter wines and sweet dessert wines are loaded with nearly two teaspoons of sugar. As a rule of thumb, the smoother the wine tastes the more sugar it probably has. If you are drinking one too many glasses of wine in the evening these days, your other half might be to blame. A study in January found couples influence each other's drinking over the years, becoming 'drinking partners'. But this can cause partners to pick up bad habits and start drinking unhealthy amounts. And while previous studies have suggested women drink more to keep up with men, the Dalhousie University in Canada one found wives are just as likely to cause their husbands to drink more. The scientists suggest being married to someone who opens a bottle of wine every night makes heavy drinking seem more normal and appealing. Red wine has the least amount of sugar, at 0.9 grams, which contributes to its known bitter taste, according to the United States Department of Agriculture. A dry white wine, such as Chardonnay or Riesling, has 1.4 grams of sugar. Dessert wines, typically very sweet and served in smaller portions, have around seven grams of sugar. The American Heart Association recommends having six teaspoons of sugar a day for women and nine teaspoons for men. One teaspoon of sugar is equal to four grams of sugar. The FDA doesn't require winemakers to list nutritional facts on products, making it difficult to pinpoint what exactly is in a drink, unless contacting the producer directly. As a rule of thumb, the smoother the wine tastes, the more sugar it probably has, according to the Montreal Gazette. Nancy Light, vice president for the main advocacy association for the California wine industry, wrote to the New York Times: 'Wine is by nature somewhat acidic, and adjustments can help to balance the elements of sweet and sour. Although one glass may seem innocent, each serving of sweet white wine is around 130 calories, according to the U.S. National Library of Medicine. This is almost equivalent to a glazed chocolate doughnut.